I’m delighted to have you visit Café Cala. 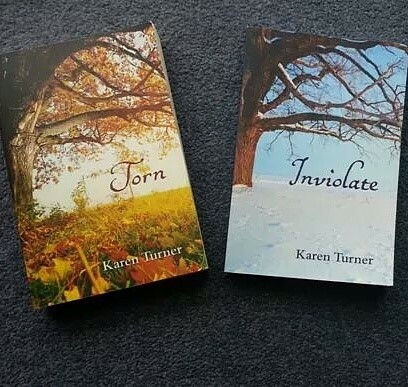 I loved both Torn and Inviolate and am eagerly looking forward to the next one in the series. I’ve been making blueberry muffins this morning. Would you like tea or coffee with yours? I’ll have a coffee thanks … love my coffee! 1 Where did you get the idea for this series? I’ve always loved to read series books so when the idea first came for Torn I knew it would be a series. The idea for the story itself started with the characters. Alex, my heroine, came first: the middle child wedged between glamourous siblings. Then as Patrick, my hero, arrived and began to reveal himself, I became enthralled with the story that started to evolve. Patrick is such a dynamic person; he is strong, witty and intelligent but also enjoys a rather seedy lifestyle that intrigued me – and judging by the feedback I receive, many of my readers are intrigued by him too! After the characters grew and became more solid in my mind, I began to see their homes and lives and suddenly the story just rolled out before me like I was seeing a movie. It’s perhaps why some reviewers have described Torn and Inviolate as being ‘cinematic’. 2 You are Australian. Why did you choose to set the books in Yorkshire? When I was 19, I moved to Yorkshire and lived in a small farming village outside of Leeds. It was there that I fell in love with the landscape, village lifestyle and the stately old homes. The village I lived in is called Otley and its neighbouring village is Wharfedale. In my books, these villages are Wolstone and Wharferidge. The descriptions of the streets, the inns and markets – everything – are genuine. Over the years I have visited Otley many, many times and have been able to view old photos from the era. This meant that when I was writing my books, I could accurately describe the village, its layout and its people as it was in the early 1800s. 3 Both books are set in the 1800’s. Is there something about this period in history that particularly appeals to you? This is an interesting question because I had never been attracted to the Regency period. When I first began writing Torn, it was set during the English Civil War of the 1640s However, as many writers have reported, characters have a way of surprising you and going off in unexpected directions. As I started to get really involved in the writing, my characters began doing things that just didn’t seem to ‘sit’ right. I stopped writing and had a good hard think about what my characters felt like and what their behaviour was indicating. I realised that I was in the wrong era for them. After a bit of research into their conduct and attitudes, I recognised the Regency period. I didn’t, however, know a lot about the era so I set about studying, reading and researching everything about how people spoke, how they addressed one another, what they wore, what they ate, what newspapers and books they were reading – even the slang they used in every day language. I had to learn all the minutia of their daily lives so I could place myself there. It was a long, but very fascinating, experience. 4 What have you found most rewarding about your writing? I always said I wanted to write the kind of books that I enjoy reading, i.e. historical dramas that are well researched and historically accurate. After completing Torn and Inviolate, I sat back and knew that I’d achieved that goal. What I hadn’t counted on was how I affected other people. I received so many emails and social media messages from people telling me that they didn’t generally enjoy the genre, but my books had changed their mind. Being stopped in the street, in a café – even at the gym – by strangers telling me how much they loved my books and my characters, is one of the best feelings a writer can ever have. Receiving emails demanding a date for the next book also brings a smile to my face. We’ve all experienced that most exquisite pleasure of reading a book that stays with you long after you’ve finished it; where you’ve fallen in love with the characters and participated in their lives and you just want more. Now and then I receive feedback from reviewers and readers in which they tell me that through my books they have experienced that same pleasure – well to me, that is the most rewarding – and humbling – thing in the world! 5 How did you start writing? I began writing as a child. I would have been less than 10 years old and would spend my afternoons after school at the kitchen table making my own versions of Little Golden Books. I wrote stories about my brother, my pets and my school friends and I illustrated them – very badly – in coloured pencil. I grew up on the Famous Five and the adventures of Enid Blyton’s classic characters inspired me to think up all manner of scrapes and dramas for my own characters. 6 What would you say has helped you most? Reading. It is said that writers should always read the genre they wish to write. I can definitely say this adage is true. However, my books fit into many genres: romantic fiction, women’s fiction, historical fiction, etc, so I read all of these. I also read other genres like biography and the odd horror. I’m not a big fan of fantasy or scify, although the Game of Thrones series is a must for anyone aspiring to write – George R.R. Martin is the bravest, most gifted author I have read in a lifetime of reading. Writers must learn all the time, they must continuously hone their craft and pay attention to the literary world around them. There is no better way to do that than to read! 7 What are you working on at the moment? Currently I’m working on the third and final book in my series. It began with Torn, continued with Inviolate and will end with this book – I’d love to give you the title but it’s a closely-guarded secret. Only a favoured few know its name and my militant media relations team have sworn me to obedience. I. Must. Not. Tell. At least not yet! Nevertheless it’s an historical fiction, set in the same house as Torn and Inviolate. Although the popular characters from the previous books make an appearance, the story mainly focuses on Jessica and how, as a young widow struggling to raise her children, she faces one of the greatest moral dilemmas imaginable. Will she be true to herself? Will she follow her heart in defiance of a world that is at war and blinded by fear and bigotry? Well, you’ll just have to wait for the book to come out! 8 What advice would you offer aspiring writers? I’ve been asked this question a lot and my answer is always the same: just start! It sounds simple and it is because stopping is the hard part. A book is never finished, you just get to the stage where you have to abandon it and call it done. The easy part is starting. Many budding writers tell me that they try to start but end up staring at a blank screen with nothing to put down. The truth is, they try to put things down but it doesn’t seem to sound right so they become disillusioned and give up. The key is to continue – just get it down. You’ll have plenty of time later on to re-work and re-draft. In fact before the manuscript is finished it will need to have gone through numerous drafts. I once heard the late Bryce Courtenay say in an interview that his books usually went through up to 11 drafts before they were ready. So don’t be put off if you think your work won’t be up to scratch. Forget all of that and just start writing! 9 Which authors do you enjoy reading? My very favourite author of all time is Pamela Belle. I’m also a fan of Diana Gabaldon and Philippa Gregory. These writers write very well researched historical fiction and they are my inspiration. Other than these ladies, I do enjoy Tim Winton and Ken Follett and have just finished Pillars of the Earth. These are only the tip of the ice berg. There are so many other writers out there whose books I have loved; I just wish I had more time to spend reading. The world is full of brilliant books! Oh – Anthony Doerr suddenly comes to mind and his book, All the Light We Cannot See. What a masterpiece that book is! These are the years between childhood and womanhood, during which Alex begins to realise that her growing affection for Patrick owes nothing to sibling fondness.But these are turbulent times for England and Patrick and Simon, answering the call of adventure, join the fight against Napoleon with devastating consequences.In a family ravaged by war and deceit Alex finds herself betrayed in the worst possible way.This is the story of one woman’s passionate struggle for love and hope against all the constraints of her time. Numb after the pain of an intolerable betrayal, 19 year old Alexandra Broughton turns to her only source of hope – an arranged marriage. Resolutely accepting this as her last chance to make a future for herself, she journeys to Scotland to face the unknown.Although Alex makes every effort to settle into her new life, she struggles to suppress the memories of her lost lover’s passionate yet faithless embrace, and remains haunted by a fleeting and impossible love affair.For Alex, this is a time of growing; a coming of age where she turns to her husband in a desperate effort to carve out a life with him, and just as it seems that contentment is within her grasp, disaster strikes.As the war against Napoleon reaches a crescendo, Alex discovers a web of deceit that slowly unravels long-held secrets to reveal the true meaning of treachery. Trapped in a loveless, violent marriage, and with nothing left to lose, Alex embarks on a fight for survival. Battling the irresistible forces ranging against her, she remains bound to the one man she can never forgive – the one man above all others she can never forget. Karen’s next book is an adult fiction set in Yorkshire 1943, and returns readers to the once glorious Broughton Hall, where war-widowed young mother, Jessica Barrow, lives with her children in the now dilapidated manor house. It’s here that she discovers a mysterious diary and through the story held within, she finds an independence and passion she’s never known before. This new-found strength will be put to the ultimate test when she encounters a stranger; a German bomber who has been shot down near Broughton Hall. 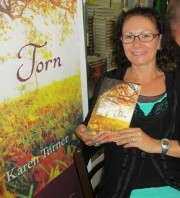 Karen’s books are available in downloadable versions for Kindle, Kobo, Sony eReader, etc. Printed books are available from book stores around Australia and also online stores such as Booktopia.